Coisas da Doris: CAMPANHA: VAMOS OUSAR??? vamos ousar mais nas nossas vidas e nas nossas casas. hoje apresento-lhes a inglesa Abigail Ahern, que faz o maior sucesso pela ousadia. tenho tanta coisa ousada na loja e percebo que as pessoas acabam , por insegurança, creio eu,comprando o óbvio, o bege, o branco o preto, vamos arrepiar??? Is Abigail Ahern the coolest chick in interior design? Famed for her edgy, eclectic taste, she runs super funky North London design boutique, Atelier Abigail Ahern and has even created a profile on mydeco. It’s no wonder all the fashion mags are stalking her.Here she talks to mydeco about how to decorate on a budget and painting her walls black. I live in… London Fields in Hackney. We moved in about nine years ago before the area wasn’t really anything. It’s become so different – I love the vibe of East London. My interior style is… really eclectic. I try and throw the rule books out and play with different periods, textures and styles. Experimenting and playing with colour is a huge part of my style. My favourite piece of furniture is… the first piece I ever bought – a concrete chair from Mint in Wigmore Street. We’d just moved back from America and had no furniture. I should have bought a sofa from Ikea but I fell in love with the chair. My husband and I had to take turns sitting on it for a year because we couldn’t afford to buy anything else! The best room in my house is… the basement because it’s an inside/outside room. We’ve taken out the exterior brick wall over the bottom two floors and put in a double–height wall of glass. The doors slide back so you’re almost in the garden. I used to be afraid of colour… but then I started experimenting and got more confident. When we first moved in we had a completely white palette but then I painted one room in very dark grey and suddenly the other rooms were put to shame. 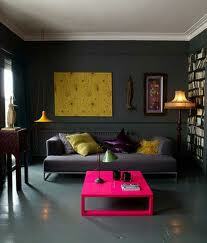 Using dark colours makes a huge difference to how objects stand out. But you have to accent with brightly coloured accessories otherwise it looks really depressing. A budget decorating tip is… to make simple floating shelves out of cheap MDF, then paint them yourself the same colour as your walls so it blends into the colour scheme of the room. It looks like you’ve spent a fortune when you haven’t. You should play on… shadow, light and nooks of cosiness. The key is to have lots of different levels of lighting – floor lights, candle lights, firelights, and table lights. I am inspired by the work of… Jonathan Adler; he plays with colour, scale and proportions. I used to work… on the picture desk for Terence Conran’s publishing company, Conran Octopus, researching images for his interior books. That’s where my love of interiors started.